"Working in cast glass with abstract sculptural forms I draw lines through space - exploring the translucent nature of glass by using twists, turns and sweeps of curve and shifts of density to lend a smooth and tactile nature to the contours of the forms. I am interested in the paradoxes of these forms – how the glass can look fragile yet is strong, is balanced yet looks precarious, and weightless - yet with form and substance." Born in Wellington in 1955, Christine Cathie has been casting glass since 2000. 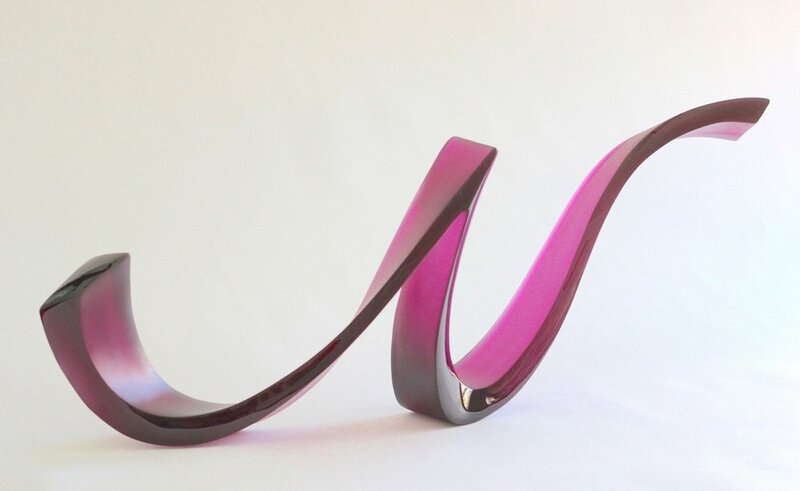 Employing tapered edges and curvaceous silhouettes, her sculptural forms draw lines through space, exploiting the translucent nature of glass to establish a dialogue between light, density and mass, and the shadow of shape and texture, and lending a smooth and tactile moment of movement to achieve balance and harmony. A four times finalist in the Australian Ranamok Glass Prize, Cathie was selected for the New Zealand show ‘Southern Exposure’ at the prestigious Glasmuseet Ebeltoft, Denmark in 2004. She was commissioned to design the awards for the Arts Foundation of New Zealand’s ‘New Generation Awards’ in 2006. Her work is held in private, public and corporate collections both nationally and internationally.